October 4th: We’ve been getting lots of bananas from Angela’s family, which means only one thing: lots of banana muffins. October 5th: This is a pretty crappy picture of the day. I’ve been baking a lot, and so I decided to take a picture of this slice of beer bread toast with peanut butter. It was a busy day, and that’s the best that came of it. October 6th: I’m no biologist (and certainly no monketologist), but I have a hunch this is a monkey. Beyond that, I’m not sure what kind it is. I actually took this from the window of my car. I had stopped on the side of the road to eat a snow cone, and all of a sudden these big monkeys started jumping between two trees to cross the road, going right above my car. It was pretty cool, but I didn’t want to stay too long, since I didn’t have enough snow cone to share. October 7th: On the beach. I teach at a resort on Wednesday nights, so on Thursday mornings I can hit the beach up for a bit. The weather was particularly beautiful this day, which is really uncommon for this part of October. October 8th: This rig is still in our bedroom from our bouts with the leaky roof a few weeks ago. I can’t seem to find any more of that polyurethane stuff, so I’ve not been able to finish the job on the roof. And because of that, I’ve not been able to take this out of the room, since I need to climb up into the ceiling sometimes during rainstorms to make sure my eventual repair actually will have worked. It’s not very solid-looking, is it? October 9th: Angela picked me up from work in the afternoon. She and our niece Mariela had taken Chubby to the vet for some vaccinations, so we stopped in Rincon for an ice cream. October 11th:”El Demonio y la señorita Prym” by Paulo Coelho. October 12th: I did a lot of baking today. Calzones and brownies, mainly. 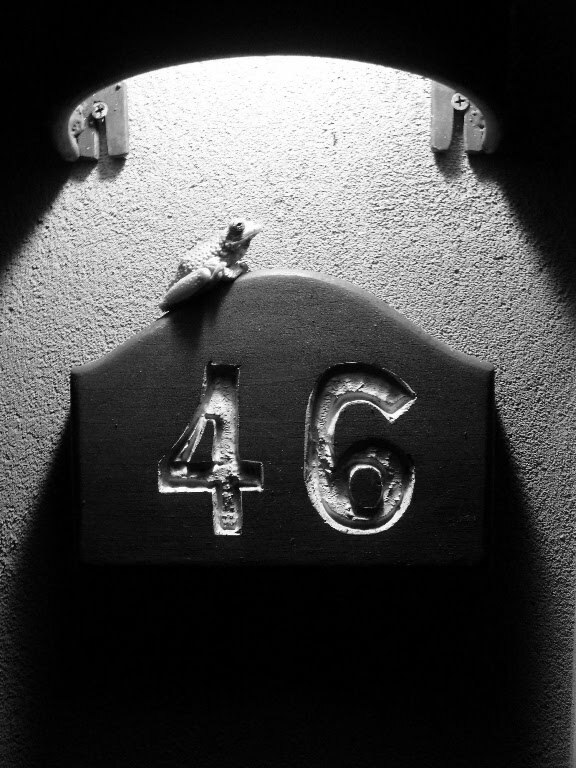 October 13th: I was staying at the hotel for my Wednesday evening class, and I found this little frog on the sign next to my room’s door. Pretty cool. October 14th: The finished brownies. Very tasty, but still not as good as mom’s (or sister’s). But partially to blame on the baking goods I had, probably. October 15th: Yep, another cat showed up. October 16th: A student’s motorcycle helmet. October 17th: A view of the Gulf of Nicoya, taken from the street in front of Angela’s parents’ house. October 18th: This is an orange, although the colors remind me of the cover of the book “Freakanomics.” It seems that here the color of a citrus fruit on the outside doesn’t necessarily correspond to what one would expect on the inside. And it seems that there are many things that are just called “lemons” by default. By the way, thanks for Paola and Juan for the oranges–they were tasty and made wonderful orange juice! October 19th: A new 20,000 colones bill that just came into circulation. That’d be about $40, which means that it’s probably going to be hard to use it to buy mints at the corner store. (Thanks for Marcia for being our hand model… one of the new “security” features in the new bills that the treasury is introducing is that if you fold them end to end, they’ll make a flower). October 20th: Waiting to get a tire changed. One of the new tires we just bought a few weeks ago got a flat and was ruined on the way to Guanacaste, but fortunately we had a spare and there was a shop just down the road. They had the tire changed and us up and going in under 30 minutes and 30 dollars, which I have to admit would be near-impossible in many countries. October 21st: An umbrella at the beach. Angela and I went to Guanacaste for two nights after my Wednesday class. October 22nd: This statue seems like it should be in a tropical setting on the other side of the world, but it was in a strip mall in Tamarindo. Angela and I went to the Automercado to buy a chicken and some other odd food items. October 23rd: I know that this is obviously blurred because of the long exposure, but I still like it. From left: Lidio, Lucy, and Wilson. I took this at a dinner for Lucy. Today was her last day at work, unfortunately (for us, at least!). She was a great mentor and we all learned a lot from her! So, whew! That was a ton of pictures! Hopefully there was something in there that was interesting for you. Thanks for reading, and have a great day! great pics as usual Sitzman. that monkey is a Congo, or Howler monkey. and nice photo of last night catching the blur of talking wil in particular was in…hahahah…good times, good times…. Actually, I had thought that may have been a “congo” monkey, although I thought that’s what they called gorillas, as well.